Streaming devices come in the form of either a dongle or a box and are your go-to for endless hours of entertainment, whether it’s watching films, discovering niche channels, playing games or browsing your social media. The core of each streaming device is pretty much the same, with your essentials such as Netflix, Now TV, Amazon Video and YouTube all featuring; it’s only when you dig a little deeper that you realise that there’s a subtle difference between each and every one available on the market. To start, you’ll want to look out for the type of content you want to experience. Just as an example, the Amazon Fire TV Stick and Google Chromecast Ultra are both common picks. But, whereas the Amazon Fire Stick offers you over 7,000 apps and 40 premium TV channels (with an Amazon Prime account), the Google Chromecast offers a limited number of channels but enables you to link up your phone or your tablet with your television for access to loads of 4K ready content. 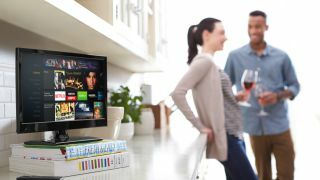 When deciding on the best TV streaming device, you’ll also need to consider the current capabilities of your television. For example, there’s no point buying a 4K streaming device for a HD ready television only, as the television simply doesn’t have the technology to playback in 4K quality. It’s the same the other way round. Why purchase a device that maxes out at 1080p (HD), when there’s boxes and dongles out there that are capable of 4K content? Lastly, you may want to look into specifics. The Nvidia Shield, while expensive, allows you to stream games, as well as the essentials to your television, while the Apple 4K TV device links up to your Apple account so you can access and view all your iPhone or iPad downloads from your television. We’ve done some research to provide you with a roundup of the best TV streaming devices. If you’re unsure of which TV streaming device is best for your setup, we’ve come up with some advice to guide you in the right direction. The Roku Streaming Stick Plus is essentially a great buy for anyone who is fed up with their clunky smart TV set up. It gives you access to all the essentials, including Netflix, Amazon Video, Now TV and the various catch up channels. Capable of 4K streaming, this is the best streaming device for 4K ready televisions. Although it is compatible with HD ready televisions, you won’t experience better picture quality if your television doesn’t have the technology to support it. Roku boast about the stick’s advanced wireless receiver, which should mean even those in attic rooms benefit from buffer-free viewing. Best of all, this stick can be taken and plugged in anywhere, as long as there’s a wireless network. That means hotel televisions lacking in channels can soon benefit from a boost of decent content. The Fire Stick offers what the Roku Streaming Stick can’t- the ability to stream music apps; in fact, there’s around 7000 streaming and music apps in total that you can access, and you can even view premium channels such as Discovery by individual subscription. While it doesn’t stream in 4K, there’s lots of features that kind of make up for it. For example, the Alexa controlled remote allows you to control your stick by voice alone, and there’s 8GB of storage and 1GB of memory dedicated to additional apps and games for a complete entertainment experience. As with the Roku device, you can take the Fire TV Stick anywhere, and watch shows where you left off. The Google Chromecast Ultra works a little differently to the others. It’s described as a portal between your handheld device and your television. It isn’t a stand alone device, so unsynced to your phone or tablet, it won’t display any content. It means your device is the platform on which to download the apps, whether it’s films, music or games - once the app is open, all you need to do is tap the ‘cast’ button to transfer the content onto the big screen. You can still use your device as normal while it’s transferring content and it also acts as a controller, too. Bear in mind that only Chromecast compatible apps will transfer to the big screen. You can also pair it up with Google Home for voice controlled viewing. The streaming device for gamers, the Nvidia Shield TV allows you to play from the big screen and benefit from a game’s full 4K potential. GeForce Now (from the makers of the Nvidia Shield) is a huge platform on which to discover PC quality games, online leaderboards and multiplayer gaming, and you can even stream your PC game library through the device to benefit from a 4K quality experience, so long as you have the NVIDIA Gamestream set up. On top of gaming, you can benefit from streaming 4K content from the likes of Netflix, Amazon Video and YouTube, and with inbuilt Chromecast, you also view photos from an iOS or Android device. Sometimes, buying a full Sky or Virgin Media box isn’t the most cost-effective way of doing things, especially when you’re only planning on watching a few channels. A Now TV Box allows you greater control over the channels you subscribe to, with various packages available, including Entertainment, Sky Cinema and Sports passes. While it doesn’t stream 4K quality content, it is the perfect boost for Freesat and Freeview televisions and for those who don’t want to tie themselves into a contract. If you’re looking for the best way to view all the 4K films you’ve downloaded from iTunes, the Apple TV 4K is the missing link. In addition to films, you can stream your music library, play games and download apps from the store. Supporting high-dynamic range video and Dolby Vision, you can expect superior visual and sound transfer from a range of 4K supporting apps including Netflix and YouTube. The controller is Siri enabled, so you can conveniently ask for a film or a song, or alternatively, you can use your iPhone or iPad as a controller and still use your device as normal. Decided you just wanna upgrade your tele? Here's a list of the best Smart TVs. If you want a smart 4K or HD tele and don't want to break the bank, T3 have also put together a handy list of the best TVs under £1000.